I got me a private room today. It was pretty nice. I was able to nap for about half of the session. And no personnel issues today so everything moved right along. I heard some folks didn’t get to go home ‘till about 8pm last night. Yeesh. I’m really starting to feel the nausea now. I didn’t eat all day but I was able to force down dinner. I still haven’t pooped so its only way out might be to come back up. Andy brought me home a large Starbucks Latte earlier ‘cause that usually wipes out my colon, but no dice. Whatever is lodged in there doesn’t want to come out. I’m retaining fluids too. My hands are puffy. Not visibly, but I can feel my wedding ring is super tight. What pee I do get out smells like I could light it on fire. 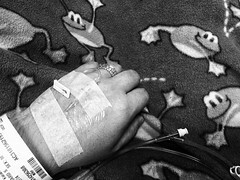 By gathering strength from my Frog Blankie I was able to do without a wrap on my IV today. I still couldn’t watch the nurse put it in, but I was able to have it out in the open. I’m started to get a little fascinated by it.